Ray Wise as Robin Scherbatsky, Sr.
Ted and Barney argue about who has "dibs" on a hot girl at the bar while Marshall's closeness with his father and desire to start a family gets him into trouble with Lily. The gang comes to help Barney's mom move out of her home, but unravel startling revelations about him. Meanwhile, Ted gets upset when Robin oversells him to a blind date. Goliath National Bank revives its headquarters project but Ted wants no part of it after what happened to him the last time. Barney tries to convince him of giving it a second chance by using all of his best womanizing tactics. Robin's post-breakup depression leads her to drunk-dial Don. Robin vows to convince the gang she is a "real" New Yorker, despite their teasing to the contrary, since she hails from Canada. When Woody Allen is spotted in a downtown restaurant, Robin and the gang rush to see the quintessential New Yorker. Ted is confronted by a beautiful girl named Zoey (Jennifer Morrison) who's upset about the landmark to be torn down to make way for the new GNB headquarters he's designing. Zoey sits in at Ted's class and gets his students on her side of the fight to save the hotel being torn down for the new GNB headquarters. Ted, Marshall and Barney see Robin in a Halloween "parade". Marshall has problems with his assistant Randy and how GNB treats people. When the gang goes to a black-tie event at the Natural History Museum, Ted gets introduced to Zoey's husband, The Captain. Barney and Robin dare each other to break the laws of the museum by touching all of the exhibits. The gang learns about Jessica Glitter (Nicole Scherzinger), a friend of Robin's from her pop-star days as Robin Sparkles, thanks to a new tape Barney discovers about a Canadian children's show. An old college friend (Jorge Garcia) with a mean streak of bad luck celebrates Thanksgiving with Lily, Robin, Marshall, and Barney. Ted, who cooked a surprise feast for the gang, celebrates the occasion instead with Zoey. After hearing startling news of Lily being pregnant, everyone must reflect on their lives. Robin becomes newly employed and Ted must do a few things because he is Punchy's best man. Meanwhile, Barney tries to get into the Christmas spirit. Marshall and Lily see a reproduction specialist out of fear she will never get pregnant while Marshall's parents pay him a surprise visit. Their quest results in both good and bad news. Robin is made a laughing stock at her new job. The gang consoles Marshall as they all return to Minnesota upon learning of his bad news. Marshall's experiences inspire everyone, causing Barney to muster the courage to find his father. Barney opens up about himself and his father to Zoey's cousin, Honey (Katy Perry). Ted, whom Zoey had tried to pair up with Honey, confesses to the group his feelings for Zoey. The gang tries to finalize their plans for Valentine's Day with less than 24 hours to go. Lily faces the prospect of spending the day without Marshall. Robin spends the holiday with her co-workers while Barney tries to take advantage of dateless women. Marshall becomes obsessed with saving the environment, and The Captain returns. Barney realizes he has heartfelt attraction for Nora (Nazanin Boniadi) and he thinks that something is wrong with him. Robin dates a guy who acts like a dog. Barney and his father, Jerome Whittaker (John Lithgow), meet for the first time as father and son. The rest of the gang are struggling with certain issues. Marshall finally leaves GNB to join an environmental organization - which does not sit well with Barney and Lily. The GNB headquarters project drives another wedge between Ted and Zoey. In an attempt to bond with his father, Barney asks the gang to embellish their histories with him by adding fake details to their lives. Robin runs into a guy she had a crush on when she and Ted were dating. Marshall and Barney begin to argue over GNB's demolition of the Arcadian Hotel, and it's up to Robin and Lily to help them make up using cocktails. Ted plans a romantic weekend away for him and Zoey. The gang finally tells Ted what they really feel about Zoey, which drives him to make an important decision. Robin and Barney meddle in Ted's relationship but things get more complicated when Barney sees Nora again. An incident makes Marshall think he could get sick with food poisoning. Ted pushes ahead with being best man at a very important wedding. Lily discovers that she is pregnant. Season six of How I Met Your Mother was met with mostly positive reviews. ^ a b Seidman, Robert (September 21, 2010). "Monday Finals: 'Hawaii Five-0,' 'Two and a Half Men,' 'DWTS,' 'House' Gain; 'Chuck,' 'The Event', Chase, Castle Drop". TV by the Numbers. Archived from the original on November 16, 2010. Retrieved September 21, 2010. ^ a b Gorman, Bill (September 28, 2010). "Monday Finals: Castle Adjusted Down; Chuck, Rules, Hawaii Five-0, 90210 Adjusted Up". TV by the Numbers. Archived from the original on October 1, 2010. Retrieved September 28, 2010. ^ a b Seidman, Robert (October 5, 2010). "Monday Finals: Castle, Lie to Me, 90210 Adjusted Down; House, How I Met Your Mother, Mike & Molly, Adjusted Up". TV by the Numbers. Archived from the original on October 7, 2010. Retrieved October 5, 2010. ^ a b Gorman, Bill (October 12, 2010). "Monday Finals: Castle, Dancing Adjusted Down; How I Met Your Mother, Two And A Half Men, 90210 Adjusted Up". TV by the Numbers. Archived from the original on October 14, 2010. Retrieved October 12, 2010. ^ a b Seidman, Robert (October 19, 2010). "Monday Finals: Castle, Lie to Me Adjusted Down; How I Met Your Mother, DWTS, Two and a Half Men, Mike & Molly Adjusted Up". TV by the Numbers. Archived from the original on October 21, 2010. Retrieved October 19, 2010. ^ a b Gorman, Bill (October 26, 2010). "Monday Finals: Castle Adjusted Down, Still Beats Five-0; Dancing, Rules, Men, Mike & Molly, Lie, 90210 Adjusted Up". TV by the Numbers. Archived from the original on October 29, 2010. Retrieved October 30, 2010. ^ a b Seidman, Robert (November 2, 2010). "Monday Finals: Castle Adjusted Down Slightly; Chuck Holds". TV by the Numbers. Archived from the original on November 6, 2010. Retrieved November 2, 2010. ^ a b Seidman, Robert (November 16, 2010). "Monday Finals: Mike & Molly, Lie to Me Adjusted Down; How I Met Your Mother Up". TV by the Numbers. Retrieved November 16, 2010. ^ a b Seidman, Robert (November 23, 2010). "Monday Finals: Lie to Me Adjusted Down; Hawaii Five-0 Up; No Change for Chuck". TV by the Numbers. Retrieved November 24, 2010. ^ a b Gorman, Bill (December 7, 2010). "Monday Final Ratings: Hawaii Five-0, 90210, 2.5 Men Adjusted Up; Skating With The Stars, Castle Down". TV by the Numbers. Archived from the original on December 10, 2010. Retrieved December 10, 2010. ^ a b Seidman, Robert (December 14, 2010). "Updated: Monday Final Ratings: Hawaii Five-0, Mike & Molly, Rules of Engagement, Two and a Half Men Adjusted Down". TV by the Numbers. Archived from the original on December 17, 2010. Retrieved December 14, 2010. ^ a b Gorman, Bill (January 4, 2011). "Monday Final Ratings: Two And A Half Men Adjusted Up". TV by the Numbers. Archived from the original on January 8, 2011. Retrieved January 4, 2011. ^ a b Gorman, Bill (January 19, 2011). "Monday Final Ratings: Chuck Adjusted Up To A Season High, Harry's Law, Rules Also Up; House, Mike & Molly Down". TV by the Numbers. Archived from the original on January 21, 2011. Retrieved January 19, 2011. ^ a b Seidman, Robert (February 8, 2011). "Monday Finals: No Ratings Adjustments For 'Chuck' or 'The Chicago Code'; 'Mike & Molly' Adjusted Down". TV by the Numbers. Archived from the original on February 10, 2011. Retrieved February 8, 2011. ^ a b Gorman, Bill (February 15, 2011). "Monday Finals: No Ratings Adjustments For 'Mad Love,' 'Chuck' Or Any Other Shows". TV by the Numbers. Archived from the original on February 17, 2011. Retrieved February 15, 2011. ^ a b Seidman, Robert (February 23, 2011). "Monday Final Ratings: 'The Bachelor' and 'Hawaii Five-0' Adjusted Up; No Adjustment for 'Chuck'". TV by the Numbers. Archived from the original on February 26, 2011. Retrieved February 23, 2011. ^ a b Gorman, Bill (March 1, 2011). "Monday Final Ratings: 'The Bachelor,' 'The Cape' Adjusted Up". TV by the Numbers. Archived from the original on March 3, 2011. Retrieved March 1, 2011. ^ a b Seidman, Robert (March 22, 2011). "Monday Final Ratings: 'Castle,' 'The Chicago Code' Adjusted Down; Dancing Stars, 'How I Met Your Mother' Adjusted Up; 'Chuck' Stays Low". TV by the Numbers. Archived from the original on March 25, 2011. Retrieved March 22, 2011. ^ a b Gorman, Bill (April 12, 2011). "Monday Final Ratings: 'Dancing With The Stars,' 'Hawaii Five-0' Adjusted Up; 'Castle' Adjusted Down". TV by the Numbers. Archived from the original on April 15, 2011. Retrieved April 13, 2011. ^ a b Seidman, Robert (April 19, 2011). "Monday Final Ratings: 'The Chicago Code,' 'Cougar Town,' 'Gossip Girl' Adjusted Down; 'Mike & Molly,' 'Mad Love,' 'Hawaii Five-0,' 'DWTS' Adjusted Up". TV by the Numbers. Archived from the original on May 14, 2011. Retrieved April 19, 2011. ^ a b Seidman, Robert (May 3, 2011). "Monday Final Ratings: 'Dancing With The Stars,' 'How I Met Your Mother,' 'Mike & Molly,' 'Hawaii Five-0' Adjusted Up". TV by the Numbers. Archived from the original on May 6, 2011. Retrieved May 3, 2011. ^ a b Gorman, Bill (May 10, 2011). "Monday Final Ratings: 'Chuck,' 'Dancing,' 'House,' 'Mother,' 'Mad Love,' 'Mike & Molly' Adjusted Up". TV by the Numbers. Archived from the original on May 12, 2011. Retrieved May 10, 2011. ^ a b Seidman, Robert (May 18, 2011). "Monday Final Ratings: 'Dancing,' 'Hawaii Five-0,' 'How I Met Your Mother,' 'Mad Love,' 'Mike & Molly' Adjusted Up; 'The Chicago Code' Adjusted Down". TV by the Numbers. Archived from the original on May 21, 2011. Retrieved May 18, 2011. ^ Justin. "How I Met Your Mother: Season 6 in Review or Ranking the Episodes". Archived from the original on May 31, 2014. Retrieved May 30, 2014. 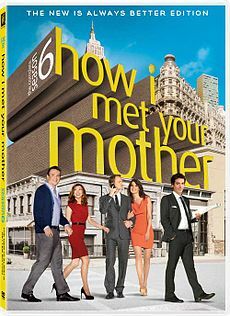 ^ "How I Met Your Mother Season 6 Episode Reviews". The A.V. Club. Onion Inc. Archived from the original on May 31, 2014. Retrieved May 30, 2014. ^ a b c d Knox, David (February 6, 2011). "Seven takes final week of summer". TV Tonight. Archived from the original on February 13, 2011. Retrieved February 11, 2011. ^ a b Knox, David (January 31, 2011). "Week 6". TV Tonight. Archived from the original on February 4, 2011. Retrieved February 11, 2011. ^ a b c d Knox, David (February 13, 2011). "Seven wins first week of 2011 ratings year". TV Tonight. Archived from the original on February 16, 2011. Retrieved February 13, 2011. ^ a b Knox, David (February 7, 2011). "Week 7". TV Tonight. Archived from the original on February 10, 2011. Retrieved February 11, 2011. ^ a b c d Knox, David (February 20, 2011). "Clean sweep as Seven rules". TV Tonight. Archived from the original on February 24, 2011. Retrieved February 20, 2011. ^ a b Knox, David (February 14, 2011). "Week 8". TV Tonight. Archived from the original on February 18, 2011. Retrieved February 18, 2011. ^ a b Knox, David (February 27, 2011). "Seven wins while Nine, TEN struggle". TV Tonight. TV Tonight. Archived from the original on April 30, 2011. Retrieved April 29, 2011. ^ Knox, David (February 21, 2011). "Week 9". TV Tonight. TV Tonight. Archived from the original on April 27, 2011. Retrieved April 29, 2011. ^ a b c d Knox, David (March 6, 2011). "Seven takes the hat trick -again". TV Tonight. TV Tonight. Archived from the original on April 11, 2011. Retrieved April 29, 2011. ^ a b Knox, David (February 28, 2011). "Week 10". TV Tonight. TV Tonight. Archived from the original on April 27, 2011. Retrieved April 29, 2011. ^ a b c d Knox, David (March 13, 2011). "Seven's dream run continues". TV Tonight. TV Tonight. Archived from the original on April 18, 2011. Retrieved April 29, 2011. ^ a b Knox, David (March 7, 2011). "Week 11". TV Tonight. TV Tonight. Archived from the original on April 27, 2011. Retrieved April 29, 2011. ^ a b c d Knox, David (March 20, 2011). "Rafters exit wins the week, and leaves window of opportunity". TV Tonight. TV Tonight. Archived from the original on April 25, 2011. Retrieved April 29, 2011. ^ a b Knox, David (March 14, 2011). "Week 12". TV Tonight. TV Tonight. Archived from the original on April 18, 2011. Retrieved April 29, 2011. ^ a b c d Knox, David (March 27, 2011). "Seven still winners as Nine, TEN lose ratings week". TV Tonight. TV Tonight. Archived from the original on May 1, 2011. Retrieved April 29, 2011. ^ a b Knox, David (March 21, 2011). "Week 13". TV Tonight. TV Tonight. Archived from the original on May 4, 2011. Retrieved April 29, 2011. ^ a b c d Knox, David (April 3, 2011). "Another week, another win to Seven". TV Tonight. TV Tonight. Archived from the original on April 8, 2011. Retrieved April 29, 2011. ^ a b Knox, David (March 28, 2011). "Week 14". TV Tonight. TV Tonight. Archived from the original on May 4, 2011. Retrieved April 29, 2011. ^ a b Knox, David (May 8, 2011). "MasterChef makes its mark". TV Tonight. TV Tonight. Archived from the original on May 11, 2011. Retrieved May 15, 2011. ^ Knox, David (May 2, 2011). "Week 19". TV Tonight. TV Tonight. Archived from the original on May 15, 2011. Retrieved May 15, 2011. ^ a b Knox, David (May 15, 2011). "Talent tops the ratings". TV Tonight. TV Tonight. Archived from the original on May 16, 2011. Retrieved May 15, 2011. ^ Knox, David (May 9, 2011). "Week 20". TV Tonight. TV Tonight. Archived from the original on May 12, 2011. Retrieved May 15, 2011. ^ a b Knox, David (May 22, 2011). "Variety the key to success". TV Tonight. TV Tonight. Archived from the original on May 25, 2011. Retrieved May 28, 2011. ^ Knox, David (May 16, 2011). "Week 21". TV Tonight. TV Tonight. Archived from the original on May 30, 2011. Retrieved May 28, 2011. ^ a b Knox, David (May 29, 2011). "State of Origin tops the week on 2.23m". TV Tonight. TV Tonight. Archived from the original on June 1, 2011. Retrieved May 31, 2011. ^ Knox, David (May 23, 2011). "Week 22". TV Tonight. TV Tonight. Archived from the original on May 26, 2011. Retrieved May 28, 2011. ^ a b Knox, David (June 6, 2011). "Got Talent got ratings". TV Tonight. TV Tonight. Archived from the original on June 9, 2011. Retrieved June 7, 2011. ^ Knox, David (May 30, 2011). "Week 23". TV Tonight. TV Tonight. Archived from the original on June 1, 2011. Retrieved June 7, 2011. ^ a b Knox, David (June 13, 2011). "Magic million eludes public broadcasters". TV Tonight. TV Tonight. Archived from the original on June 15, 2011. Retrieved June 17, 2011. ^ Knox, David (June 6, 2011). "Week 24". TV Tonight. TV Tonight. Archived from the original on June 13, 2011. Retrieved June 17, 2011. ^ a b Knox, David (June 19, 2011). "Origin tops the week but Seven takes the ratings game". TV Tonight. TV Tonight. Archived from the original on June 23, 2011. Retrieved July 2, 2011. ^ Knox, David (June 13, 2011). "Week 25". TV Tonight. TV Tonight. Archived from the original on June 16, 2011. Retrieved June 17, 2011. This page was last edited on 28 February 2019, at 16:32 (UTC).